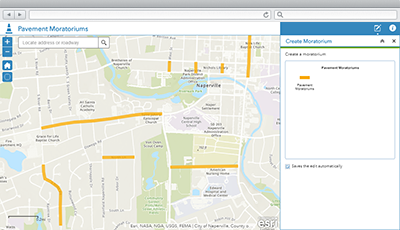 Pavement Moratoriums is a configuration of Web AppBuilder for ArcGIS that can be used by engineering and operations staff to inventory moratoriums that preclude, or restrict, right-of-way activity on newly paved streets. Moratoriums identified by staff can be shared with private utilities and other external agencies so they understand the impact of any work planned in the same right-of-way. To deploy Pavement Moratoriums with the ArcGIS Solutions Deployment Tool requires specific software. To manually deploy Pavement Moratoriums in your organization requires specific software. Application Pavement Moratoriums An application used by engineering and operations staff to inventory moratoriums that preclude, or restrict, right-of-way activity on newly paved streets. Map Pavement Moratoriums A map used in the Pavement Moratoriums application to inventory moratoriums that preclude, or restrict, right-of-way activity on newly paved streets. Feature layers PavementMoratoriums A feature layer used to store moratoriums issued on newly paved streets that preclude, or restrict, right-of-way activity. Below are the release dates and notes for Pavement Moratoriums.